we also promised five more; so here they are! The ball can leave the clubface in one of 360 directions, and 359 of them are wrong. that stops it quickly on the green. 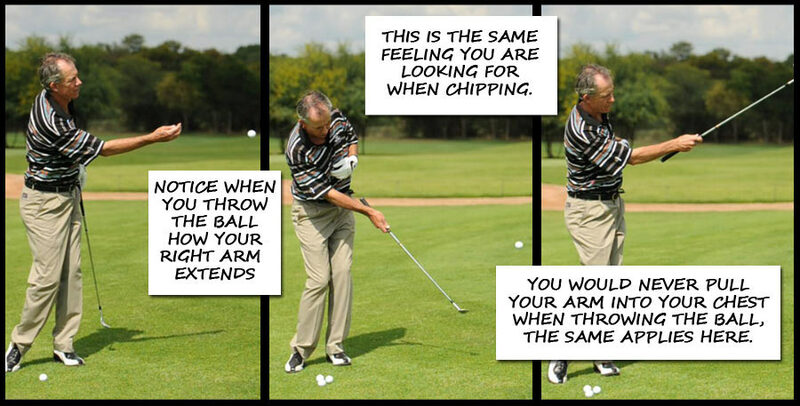 Far too many golfers try to lift or scoop the ball; don’t! This sounds complicated, but it’s not; all it entails is some common sense and some restraint. If you’re a 20 handicapper faced with 200 yards to carry some water then be honest with yourself; you almost certainly aren’t going to make it – so why risk it? Take out the Wedge and leave yourself with a nice full approach shot into the green. A right handed golfer should finish their swing with the weight on the left foot, and the right foot up on its toe. No matter your build or height, if you aren’t finishing your swing like this then something before it has gone seriously wrong; that means you aren’t turning through the ball properly and you’re missing out. Have you ever seen a golfer leaning over to the left or right, arms and legs splayed out in different directions after they’ve hit an arrow-straight tee shot? Me neither. Stay grounded, swing within yourself and improve your accuracy. How serious are you about improving your game? so click here to contact me and I’ll design a customized, expert solution that will fit your requirements. 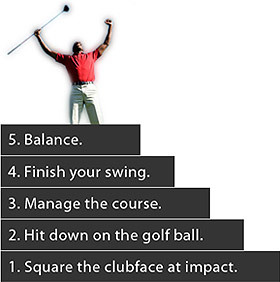 IMPROVE YOUR PUTTING BY PRACTICING YOUR CHIPPING? The better your technique, the less you will rely on feel, and nowhere is that more evident when you are within 50 yards of the green. How often have you heard playing partners bemoan their lack of practice or game time, blaming it for a poor pitch or chip? Actually most amateur golfer’s poorer Pitch or Chip shots are as a consequence of a poor technique. If they do practice then they are usually trying to find a way to make a bad technique work! Next time you’re out on the course count the number of times an ‘up and down’ from near to the green would have saved you a shot (or two). If that number is anywhere near double figures you don’t have an excuse. Improve that technique. From close to the green the Putter is the ‘percentage’ play for most golfers. Now put an obstacle in your path – some fringe or some rough or a bunker for instance – and all of a sudden the benefits of the rolling ball start to decrease. It’s time to chip. At this point you don’t want to be thinking about the connection itself – that will end in tears – you need to be judging the distance and trajectory control required; all aspects controlled by the right side. There’s a reason why this is called the ‘scoring zone’; it can make or break a scorecard. Take advantage and click below for a simple drill that will add some much needed consistency (and therefore confidence) to your short game. Click here for Short-Game Test. This entry was posted in golf, golf instruction, golf tips, sports and tagged golf fitness, golf lessons, golf plane, golf practice, golf slice, golf swing, golf tips. Bookmark the permalink.